Good Luck Charms? Who Needs Them? 4. Four Leaf Clover – Due to their rarity, they’re thought to be the ultimate sign of good luck. The four leaves allegedly represent: fame, health, wealth, and love. You only get one, what do you pick? 5.Lady Bug – Called the ‘Glueckskaefer’ in Austria, meaning ‘lucky bug’. Does that make more sense than a ‘lady bug’?! Although some believe that if you and a ‘special lady’ see a lady bug at the same time, you’ll fall in love. Others believe that if a lady bug lands on you and you don’t brush it off, you’ll have good luck! 6.Rabbit’s Foot – Ancient African folklore explains that the rabbit’s foot gets it’s power by being full of evil itself. When you carry the rabbit’s foot with you, outside evil will apparently ignore you. Not creepy at all, right? 7.The number 7 – See what I did there?? Either you love it or you hate it. Turns out, history can’t decide whether 7 is actually full of luck or evil. Some believe in its’ goodness (recurring use in religion, and the planets that formed our calendar) – others believe in it’s darkness (break a mirror – 7 years bad luck, and in some cultures the number is a sign of death). Comforting right? 8. Lucky Dice –The only conclusion we can draw is that the superstition comes from the fact that so many games of chance are played using dice. Can we just agree to put a ban on those fuzzy ones that used to hang from everyone’s rearview mirrors? Those are awful! 9. Wishbone – A tradition most will equate with holiday dinners, the wishbone is taken out of the turkey and dried overnight. The next day two people use a pinky to pull on either side of the wishbone while making a wish, the one that ends up with the biggest piece, is granted their wish. There must be a way to cheat! 10.Rainbows – Pretty obvious right? 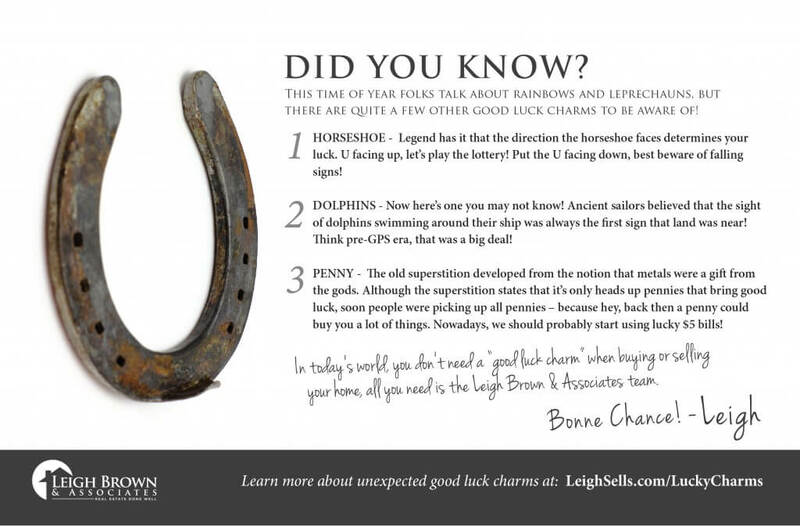 Leprauchan, pot of gold, ‘luck of the irish’ – you’ve heard them all before. But has anyone ever ACTUALLY found the pot of gold at the end of the rainbow?